EN: The first thing I ever sewed was a quilt, in fact I taught myself how to sew by making a quilt cover, and watching many, many tutorials on Youtube. The quilts were all very pink, and uneven, because I cut everything out with scissors instead of using a rotary cutter and a ruler…and since I didn’t know how to backstitch…the quilts all fell apart, once I put them in the washer for a spin. I also never attempted to actually quilt them myself, because I didn’t think my sewing machine could handle it and I didn’t have a walking foot, back then. OOPS! EN:Until late last year all I ever sewed, were clothes and the occasional curtain or pillow cover and I didn’t have any further aspirations to go back to basics aka take on quilts again. I did however take up English Paper Piecing and fell down the rabbit hole making hundreds of 2.5 inch hexagons. As tedious as that sounds, I really enjoyed making tiny little hexagons and basting them by hand. I was looking at some Youtube videos and stumbled over a Flying Geese ruler and was mesmerized, in fact I was so impressed by the whole video, that I ordered that ruler over Amazon that same day and started on my new quilt that week. DE: Ich habe bis letztes Jahr ausschliesslich Kleidung genaeht, natuerlich habe ich den einen oder anderen Kissenbezug und eine Gardine genaeht, aber das fand ich nicht Ansatzweise so toll wie Klamotten naehen. Ich konnte mir auch ueberhaupt nicht vorstellen, noch einmal eine Decke zu naehen, und dann stolperte ich ueber das English Paper Piecing und legt alle meine Naehprojekte auf Eis. Es gefiehl mir sehr gut die kleinen Stuecke Papier mit Stoff zu umwickeln und mit der Hand zu steppen, es gefiel mir so gut, dass ich fast 700 Stueck naehte um sie dann anschliessend in eine Decke umzuwandeln. LOL!! Ich hatte mir ein paar Youtube videos dazu angesehen und saht ein Tutorial fuer ein Flying Geese Lineal und war von den Socken! Ich habe das Lineal auf Amazon gefunden und es bestellt und innerhalb wenigen Tagen diese Decke begonnen. EN:I had ordered a bag of liberty bits from Kat’s Fabrics, (she sells offcuts by the kilo, I will not lie I have another kilo of liberty bits in my stash just waiting for me to make them into another quilt!) a few weeks prior to make even more hexagons and then abandoned the idea to make this quilt. I didn’t use a pattern and instead just made a few geese and then arranged them into different patterns, until I liked what I saw. EASY! For the backing I used 2.5 meters of Liberty that I got for a steal at the Rag Market in Birmingham and then added 40 cm of white brushed cotton on both sides. I used the leftover Liberty backing to make my own bias binding, as I felt it would make the entire quilt look a little more polished. DE: Ich hatte vor einigen Wochen ein Kilo Liberty Stoffe von Kat’s Fabric bestellt, (sie verkauft sonst immer Liberty Stoffe in 2-3 Meter Laenge) um weitere Hexagone zu basteln, beschloss aber die Stoffe nun fuer die neue Decke zu benutzen. Ich habe kein Muster verwendet sondern einfach einige Gaense erstellt und dann einfach alle so lang angeordnet, bis ich damit zufrieden war. EASY!!! Fuer die Rueckseite der Decke habe ich auch einen Liberty Stoff benutzt, den ich in Birmingham auf dem Stoffmarkt gekauft hatte, es handelt sich hier um B-Ware, der Preis dafuer war daher sehr guenstig! =D Das Querband habe ich dann mit den Resten selber genaeht, gebraucht habe ich 8 Meter… ich habe noch 7 Meter uebrig, die ich fuer irgendetwas anderes nutzen kann. DE:I would say the entire process took me about 6 weeks, I ran out of white cotton a few times and then couldn’t decide what to do about the backing. Once I had finished the quilt top I posted a picture of it on Instagram and asked if anyone had ever used a quilting service before, and was put in touch with the fantastic Cath who took on my quilt.What can I say about Cath, she’s an amazing longarm quilter based out of Cumbria, you can get in touch with her over her Facebook or Instagram account. She gave me all the information I needed before I sent out my parcel, asked me what I kind of quilting I would like and sent me many pictures of patterns until I found what I was looking for. She quilted everything within 3 days of getting my parcel and sent it back, so that I would have it for the weekend. The results are absolutely fantastic, THANK YOU SO MUCH CATH!! There is no way that I could have even come close to what she did and I am eternally grateful. DE: Fuer die Zusammensetzung habe ich ca. 6 Wochen gebraucht, mir ist mehrmals der weisse Stoff ausgegangen und ich konnte mich lange nicht entscheiden, was ich mit der Rueckseite machen wollte. Als ich dann endgueltig fertig war, habe ich ein Bild auf Instagram hochgeladen und die Community gefragt, ob jemand den einen Quilting Service verwendet hatte. So habe ich Kontakt mit Cath aufgenommen, die eine Longarm Quilterin aus Cumbria ist. Sie hat mich unheimlich gut beraten und die Decke innerhalb von 3 Tagen Versandfertig, gequiltet. Ich bin immer noch total geschockt, wie schnell das alles ging und wie toll die Decke geworden ist! VIELEN DANK CATH! EN:All I did to finish of my Flying geese quilt was to sew on the binding, with my sewing machine on the one side and slip stitch it by hand on the other side. I really enjoy hand sewing things, and watched the entire second season of Fortitude, which was crazy!!! !Anyway, making this, has really peaked my interest in quilting again, I’ve since bought a few modern quilting books and started on another quilt for my sofa! 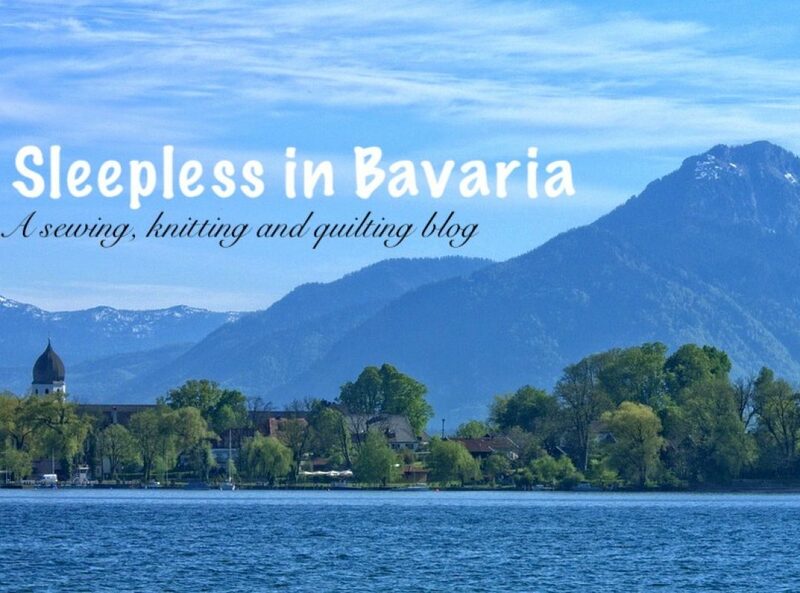 And even shocking myself, I have gotten in touch with the Modern Quilting Guild in Munich, so I will hopefully meet other avid quilters once I move back! I feel incredible proud of what I’ve done and I hope that perhaps other seamstresses might take on quilting as well.